2016’s gingerbread house project - with houses! If anyone out there thinks you can’t learn a lot by playing, it’s time to disabuse oneself of the notion! Even engineering firms and architectural firms create full blown models of the buildings they are considering constructing. Why? Partly for the visual, but also to discern potential engineering issues, costs, and material requirements. If you’re thinking of building your own house someday, feeling festive or perhaps have kids and friends who want to learn a bit about basic building techniques and the engineering behind the skills, try building a gingerbread house! Sugar and Spice and Engineer Nicely! Here’s what I recommend and why. If you recall building gingerbread houses as a kid, as I have been recently, you might remember that we often pasted our baked dough to the outside of some sort of frame. My memory is a little hazy but I feel like we might have used modified milk cartons or small boxes. The big question is why. It’s a teaching point, actually. If you attempted to just sugar paste your walls in place with nothing inside and then go straight to throwing on the roofing members, no matter how sticky your sugar glue or how tasty your gingerbread, you are probably going to experience some engineering problems as you carry on. Gluing the roofing timbers right on top of an inappropriately supported frame could cause a host of lateral engineering nightmares, including outward thrust and racking of your building. Your cookie masterpiece will eventually be a pile of crumbles, just as it would if you attempted to build a “real” building this way. Load needs to be transferred in a way that provides structural integrity by carrying weight all the way to the foundation. Either use an interior frame of some sort of get really gucci and consider it solved by using load bearing interior walls, shear wall panels (for the sake of holiday ease, use an appropriate cookie equivalent of well glued 2 foot unbroken panels in the corners…too many windows in your walls might require an engineer’s stamp in your jurisdiction). Don’t forget that a Glu-Lam like potential is always there in the world of cookie construction. If you need a bigger timber but don’t have it on hand, scab it together with more icing and cookie! Suddenly you’ll have so much more support for spanning greater distances appropriately. The IRCC (International Residential Cookie Code) may have helpful tables available if you can get your hands on one. Times have changed as building sciences have gotten more sophisticated. But not all of the methods of the past are outdated…sometimes it’s just so hard to find good material (really strong dimensional timber at reasonable prices - or at all) and we come up with new ways to solve problems. Nowadays, load bearing walls and other ways of transferring load do the work that standing beams or pillars used to do…When you are supporting your cookie structure…rather than lolly columns or partitioning your home using walls where you might not want them, consider the candy cane (or the Lolly-Pop, ho ho ho!). They have myriad benefits. They’re ubiquitous. They’re inexpensive. They are striped in jolly colors and fit into nearly every gingerbread decorating scheme. You can used the curved ones or the straight ones, and they even come in different circumferences and lengths. Make sure to put a few in the corners of your building and perhaps position a few carefully under the ridge beam, or wherever point loads might be a concern. If any candy can solve a structural problem, the candy cane is your go to! Don’t Forget about Snow Load! I don’t know about you or your kids if you have them but when I was a kid, gluing the gingerbread together was merely the preamble to the real fun of loading the roof with tons of sugar frosting and gum drops and other candy decorations. Sounds a lot like snow load to my adult ears. Another great teaching point. How to be able to load that roof with decorations (think Minnesota snow load!) and not end up with an unsightly sagging roof or more lateral troubles. Be sure to include strong structural cookie components when building the roof. I imagine the equivalent of some long rectangular gingerbread pieces here, maybe looking vaguely reminiscent of 2 x 12 lumber. You might be able to size those rafters down a bit if perhaps you are a candy and frosting minimalist (the gingerbread equivalent of a Palm Springs location?). So give this a bit of thought with your building crew. It might be worth some discussion over a hot chocolate or two. Support the roof so it can handle all the weight you might add to it. All that icing sugar and bulk bin candy (I mean snow and ice!!) can really add up in terms of weight. A Properly Built Home Will Last For Years to Come! Build for the ages! A properly built home, whether of cookies, candy and sugar or the less tasty materials from lumber yards, should be built to stand the test of time. 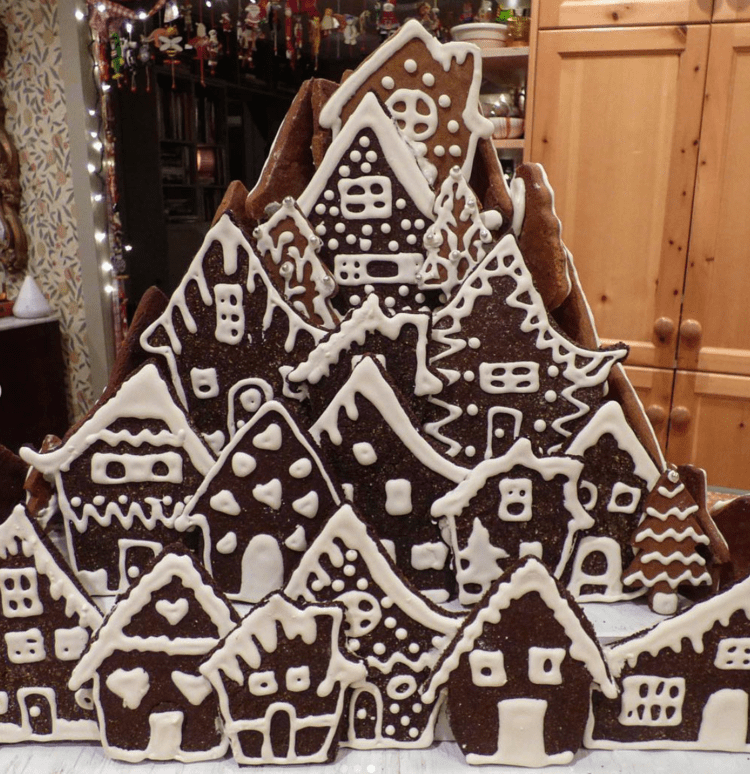 If you’re feeling like the whole idea of building a huge gingerbread home is overwhelming or too grand, don’t forget that you can start small. The joys you receive from your home will carry on for many many seasons to come, so see what you learn and enjoy the process!